It’s very difficult to get excited about Ffynnon Wyryd, It’s one of those wells that you have to see, to tick off because it’s on the list; but why it’s on the list no one is really quite sure. It was recorded by the Royal Commission in 1912, mainly because of its abundant supply of excellent water. 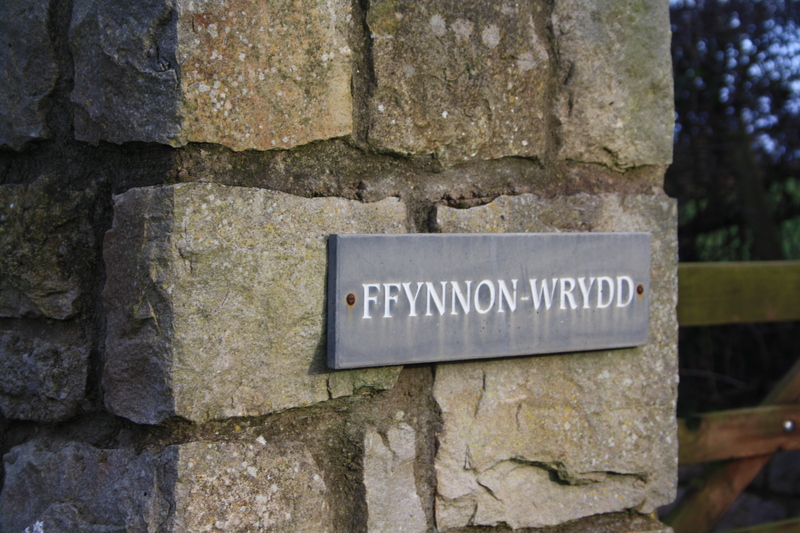 However its historical significance seems to be based solely on its name, which appears to be a personal one, there don’t appear to be any legends or traditions surrounding Ffynnon Wyryd. Jones records it in his category E, miscellaneous named wells. CPAT suggest that, although it appears hamed on the earliest Ordnance Survey maps, the name actually refers to the group of cottages beside it rather than the well itself. 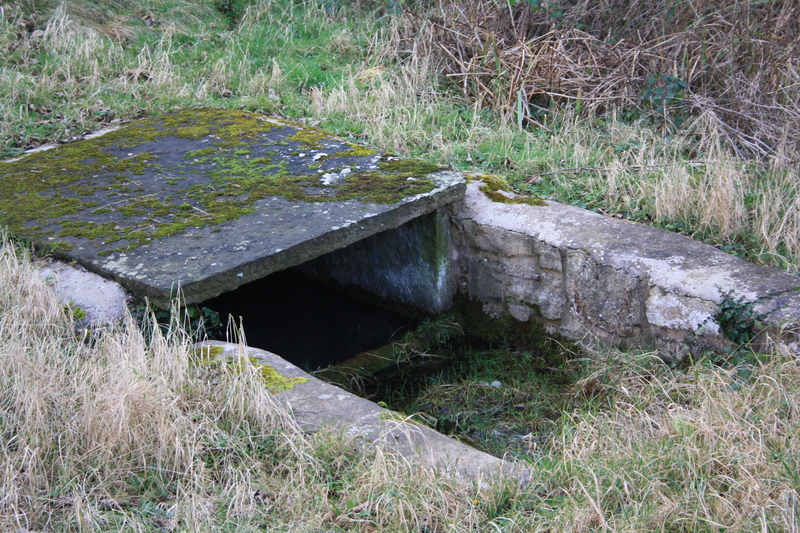 The well today consists of four vertically set stones forming a basin, with a large stone slab some two metres long and around a metre wide laid on top. One side is open, below ground level and stone steps lead down to access the water. This stepped area outside the well was also filled with water on the day of our visit. It is found by the side of an unmade road serving a few houses about half a mile to the east of Pen-y-cefn, north of Caerwys. 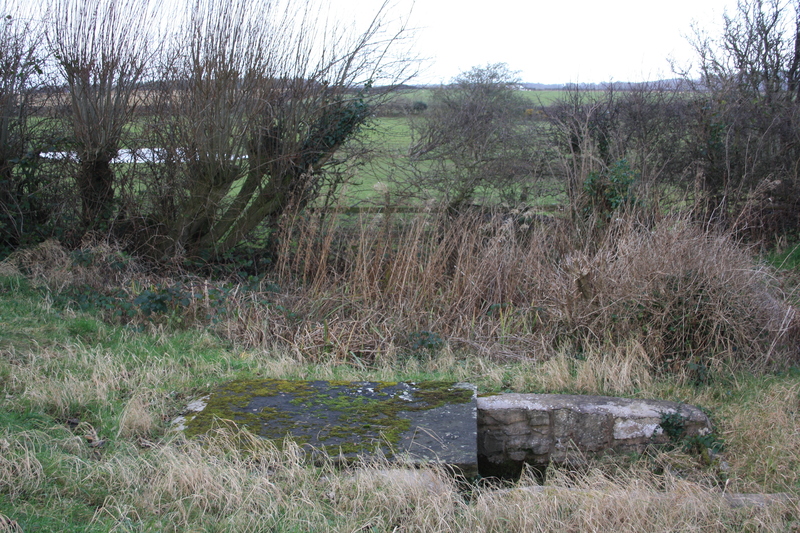 The well has been substantially restored at some point during the 20th century, and it is difficult to know how much, if any, of it is particularly old, or part of any original structure. We found that the excess water appears to be drained away through a half buried length of metal drain pipe which flows out into an old bath in an adjacent field. 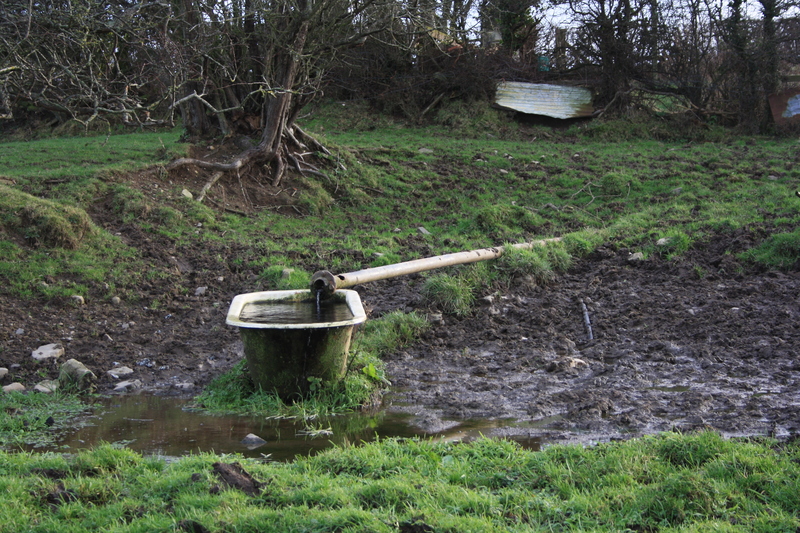 The marshiness of the area around the bath gives testament to the abundance of the well. The group of cottages by the well appear to have been consolidated into a larger house, which still bears the name, albeit misspelt, on the gatepost.